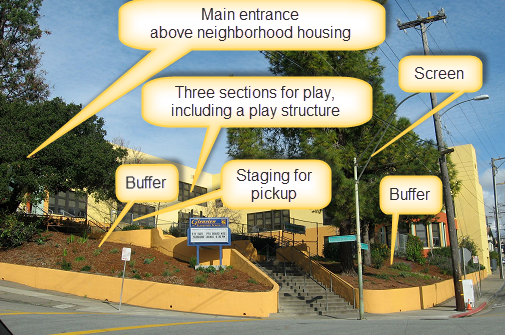 Existing design: Neighborhood easements and after school dynamics were considered. Easements in front buffer the school from the street. Main entrance is inset and acoustically contains and directs sound away and above the neighborhood households. Preliminary proposed architecture-image: It appears that neighborhood easements were not considered. (Neighbors were not represented in the preliminary architecture requirements.) -After school dynamics did not seem to be considered. Children do not have an obvious place to run amok within safe and controlled areas. Though not obvious in the image, we can assume that the entrances were not acoustically designed to contain sound since it is doubtful the neighborhood was considered for this rendering.